Disclosure: This post was sponsored by Walmart. I was compensated for my time and efforts in creating this post. All thoughts and opinions are my own. The best part of football season has got to be the food. Whether you love dips and appetizers or chicken wings and sliders, game day food is simply the best. When it comes to feeding a crowd, I like recipes that are not only easy but also delicious. Today I’m sharing with you how to make one of my favorite game day recipes. 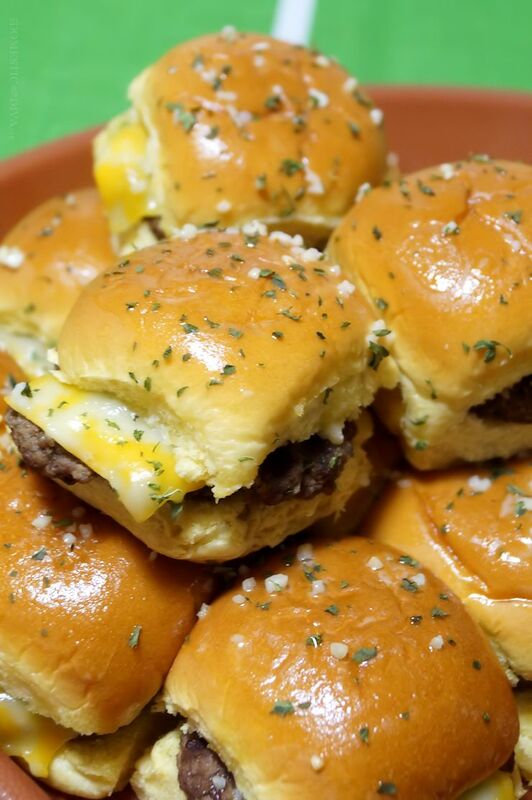 My family loves to eat mini cheeseburgers especially while watching a big game. 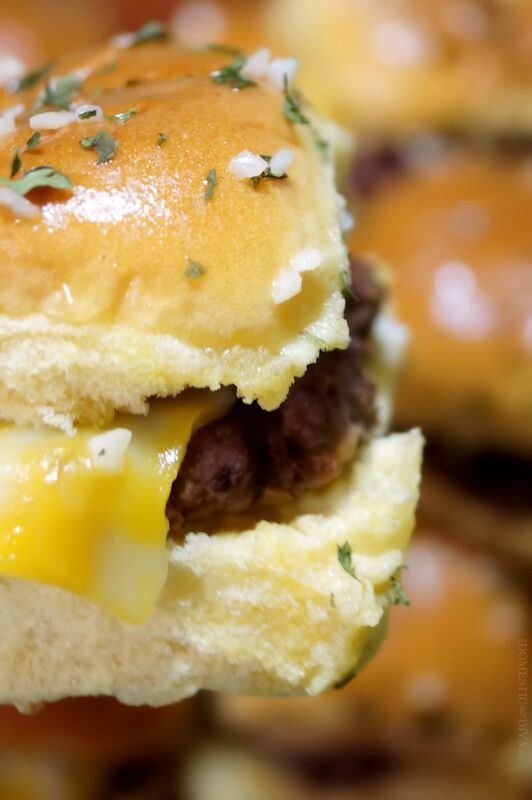 Below you’ll find an easy way to make mini garlic cheeseburgers for a crowd. Do you have a favorite game time recipe? Check out Walmart’s Game Time Recipes for inspiration and start getting creative in the kitchen. Share your own recipes on Instagram or Twitter using #WalmartMVPContest to be entered into the 2015 Walmart Game Time MVP Contest. If you are like me, you love watching YouTube videos over regular TV at times. Check out how some Youtubers put a Game Time spin on traditional nachos: How to Make Nachos on iJustine Cooking & Totchos – New Take on Nachos! by Cook with April. In a large bowl, combine ground beef, minced garlic, dried minced onions, and Worcestershire sauce. Divide meat into 12 even portions. Between two pieces of plastic wrap, flatten each portion with a rolling pin until about 1/4 to 1/2 inch thick. You want the burgers just slightly larger than your dinner rolls as they will shrink to the perfect “bun size” as they cook. In a preheated nonstick pan, cook burgers on medium-high heat. Once one side begins to brown, flip the burger with a spatula and continue cooking until cooked all the way through. Cooking times will vary. Burgers will be done meat is no longer pink in the center. OR….These mini burgers can also be cooked on an indoor grill like this Hamilton Beach Indoor Grill. Simply place each burger patties onto the bottom plate of the preheated (450°F) indoor grill, press the top plate down, and cook until burgers are done. Once burgers are cooked, slice dinner rolls in half and place one burger patty inside. Take one cheese slice and fold in half, place half a slice of cheese on each burger before place the dinner roll top back onto the burger. Combine melted butter and teaspoon of garlic. After placing all of the assembled mini burgers onto a baking sheet, brush the tops of the dinner rolls with the garlic butter mixture. Cover baking tray with aluminum foil and bake in the preheated 350°F oven for 5 minutes until rolls are soft and cheese is melted. [Do you have a recipe that you like to serve your family and friends during Game Time? Don’t forget to share your favorite Game Time recipe on Instagram with #WalmartMVPContest! Share your game time recipe and post it on Instagram or Twitter using #WalmartMVPContest to be entered to win a trip to LA to go to the YouTube studios to have a pre-Superbowl party and create content with YouTube stars. For complete rules, head on over to the Game Time MVP official contest rules page on walmart.com. 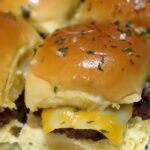 NOTE: [Updated February 2018] This contest may be over, but this mini garlic cheeseburger recipe is still a family favorite and sure to be a winner at your next football party. If you liked this recipe? You are going to LOVE this one! 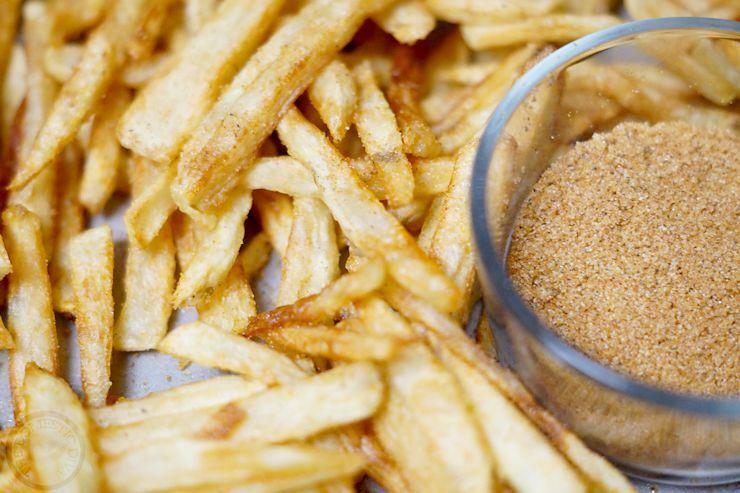 Learn how I make Homemade French Fries and the secret to The Best (most addicting) Seasoning Salt. These french fries go perfectly with mini garlic cheeseburgers and are so easy to make! Disclosure: This post was sponsored by Walmart. I received compensation for my time and efforts in creating this post. All thoughts and opinions are my own. These look so very yummy! I featured your recipe in my Saturday Morning Coffee Cafe post this week. Have a great weekend! Awesome! Thank you so much, Dori. I’ll take a look!!! What is the green seasoning on top of buns? Just some dried parsley for color. After you bake them and they are all ready, how do they stay warm & fresh for tailgating? Could you do everything except the last step (melted garlic butter over top. bake for 5 min) the night before, then do this last step the morning of, wrap individually in foil and put in cooler to stay warm? Im trying to figure out if they would get soggy or if they would be ok….Do you know? I am not entirely sure as I have not tried that. However, if I were to pack and travel with them that sounds like how I would more than likely do it. I would imagine that the foil would help to “steam” the burgers during travel so that the buns would stay nice and soft. Whenever we pack hotdogs for baseball games, we cook them then wrap them in aluminum foil and place in an insulated cooler. When it comes time to eat them at the game, the hotdogs are warm and the buns are soft. Let me know if you try it out and what your results were. Thanks for commenting! does the patty sog the bun while in the oven? They did not make the buns soggy when I did this. If it is a concern for you, you could try lightly patting the patties with a paper towel to remove any excess moisture before adding them to your buns. Loved this recipe. I use my own burger recipe and after frying them lie them on paper towel to soak up any excess grease. They were amazing and were having them a second time today with Hawaiian buns this time!! This looks delicious! I am excited to try :) I have a game day dessert to pair it with. Hope you enjoy!